Waking The Bones: I'm Back in Blogland...But Who Got The Goats? I'm Back in Blogland...But Who Got The Goats? Yes, it's been a long while since I updated this blog, however a lot has been cooking while I have been silent. I'm not spilling the beans (hmmm...lots of cooking metaphors...) quite yet on the new and exciting projects, though I will drop the major hint that they involve Creativity, Self-Expression & Actualization, Quantum Physics, and Special Guest Stars, so do stay tuned for lots of Goodness. In the meantime, a giant Thank You to everyone who took the time to vote for my dear friend Kristen in the Goat Giveaway. Your efforts were not in vain 'cause she won! I got to be there on the day she picked the sweet critters up. Can you imagine a happier new goat mommy? 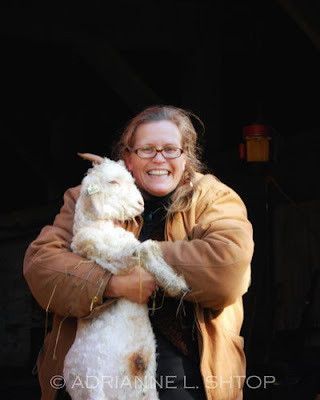 You can visit the herd and congratulate Kristen over at Gilead Goats. Welcome back to the blogland, so nice to see you back. Can't wait to hear all your news. Extra special thanks to all your readers for voting! You'll never know how much this has meant to me, and what wonderful lessons have come my way. The goats are missing their favorite aunty, when oh when are you coming to visit us? Oh I'm tickled pink to have found you through Gilead Goats! Darx-- Thanks! It's good to be back. As always, I appreciate your excellent encouragement and can hardly wait to see what comes next. Kristen-- Yay! I'm so happy you and your goats found each other. I'm looking forward to getting to see you all blissful together at home. Give them a scritch from me in the meantime. Diane@Peaceful Acres-- Welcome! So glad you found me. There will be a lot more photos of the Gilead Goats coming soon. And I need to find out more about Peaceful Acres. Sounds very intriguing!